And his face seemed engraved rather than sculptured in flesh. After attending Whitgift Middle School in Croydon Hayter left school to work as a research chemist in the laboratory of the Mond Nickel Company. Concurrently he was enrolled as a part-time student in chemistry at Kings College, London. At the end of WWI, Hayter left his job at Mond Nickel to become a full time student at Kings College. Hayter subsequently graduated from Kings with an honors degree in chemistry and geology. He continued to do research into organic sulfur compounds under Prof. Samuel Smiles at Kings College until 1922. Hayter accepted a job with the Anglo-Iranian Oil Co. and was sent to Abadan where he worked for four years. During this period he began a series of pencil portraits of Anglo-Iranian personnel of which about 150 were completed. Painting of this period are mostly landscapes, rivers, seascapes, boats and the oil refinery plant. At this time Hayter suffered an attack of malaria and was sent home to England. The Anglo-Iranian Oil Co. arranged a one man show at their corporate headquarters and almost all of the paintings were sold. This show may have been the determining factor in Hayter's decision to become a professional artist. 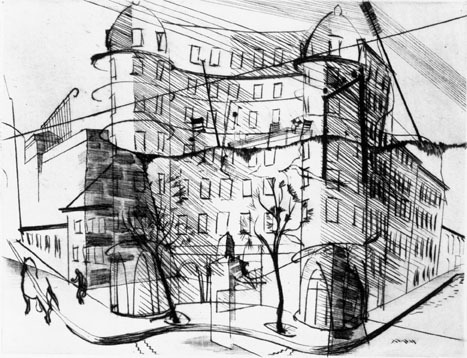 Stanley William Hayter (Rue des Plantes) 1926 (c) 2016 Stanley William Hayter - Artists Rights Society (ARS), New York / ADAGP, Paris. 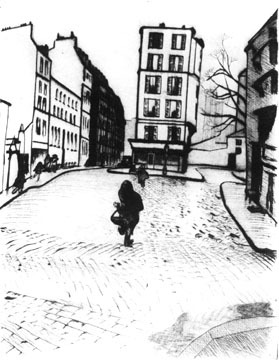 Hayter moved to Paris close to Giacometti's studio. In the beginning he spent several months studying academic techniques at the Academie Julien. He made friends with Giacometti, Balthus, Calder, Anthony Gross and Joseph Hecht. He began to work in Hecht's studio and was introduced to engraving on copper at this time. He exhibited work at the Salon d'Automne. Alice Carr de Creeft (wife of sculptor Jose de Creeft) came to Hayter with a friend to buy prints. A week later they returned and asked him to teach them printmaking techniques. Intending to discourage them, Hayter said that he didn't have a press or the equipment necessary to teach them but if there were two more people interested in learning, he might consider it. A week later they returned with two others and persuaded Hayter to set up a workshop. Joseph Hecht (1891-1951) at his press. Hecht helped him get his first press and by the end of 1927 there were ten people working in the atelier. It was moved to a larger location at the Villa Chauvelot where it stayed until 1933. First one man exhibition in London at the Claridge Gallery. He began to exhibit with the Salon des Surindependents and at this time meets Joan Miro, Hans Arp and Yves Tanguy who begin to work in Hayter's atelier. Stanley William Hayter (Place Falguière [Paysages urbains] )1930 (c) 2016 Stanley William Hayter - Artists Rights Society (ARS) / ADAGP, Paris. Stanley William Hayter  (Untitled [L'apocalypse]) 1931 (c) 2016 Stanley William Hayter - Artists Rights Society (ARS) / ADAGP, Paris. 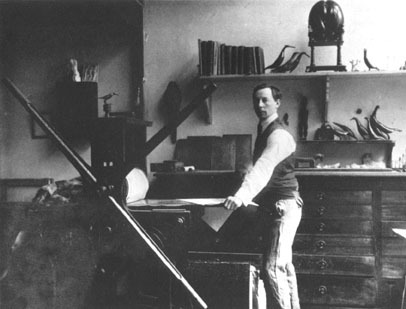 Hayter's print studio was moved from Villa Chauvelot to 17 rue Campagne Premiere where it remained until the beginning of WWII. This location was very near Montparnasse, one of the liveliest artists' quarters in Paris. Hayter exhibited with the Surrealist group in Paris in 1933 and continued to exhibit with them throughout the 1930's. He left the movement when Paul Eluard was expelled. 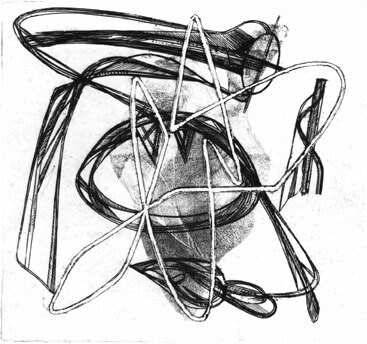 Eluard's poem Facile Proie (1939) was written in response to a set of Hayter's engravings. Other writers with whom Hayter collaborated included Samuel Beckett as well as Georges Hugnet. Stanley William Hayter (Oedipus) 1934 (c) 2016 Stanley William Hayter - Artists Rights Society (ARS) / ADAGP, Paris. This engraving and softground etching foreshadows the "automatic" side of Hayter's work which is seen more clearly later on. In 'Oedipus' of 1934 the results of experimenting in Atelier 17 can be seen in a whole series of new devices. The theme of Oedipus as the riddle solver is here given effect not only by the elaboration of three dimensional form through the linear patterns of the burin, but also by a white line channeled out of the copperplate and by the palm print of the artist's hand impressed through a soft ground to form a background texture on the plate. The artist remarked in About Prints, 1962, that it is probable that "the first print observed by man was his own footprint or hand print", and that it had a magical quality as an expression of his identity. He has also drawn attention to the mysterious effect of white line in relief in an intaglio print. Though it stands up above the surface of the paper it appears to recede in part from the spectator's eye. In this counterpoint of form and line there seems to be a veiled allusion to the place where three paths cross which lead to the discovery that Oedipus killed his father. Atelier 17 held the first two shows of prints done at the workshop at Galerie Pierre (Loeb) in Paris and Leicester Galleries in London. 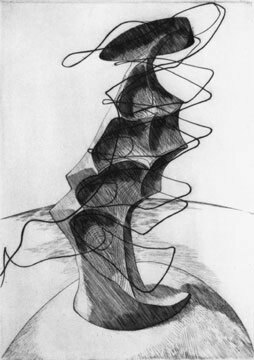 In 1936 Hayter helped to organize the first International Surrealist Exhibition in London. From 1934 to 1939 Hayter was in frequent contact with Picasso and gave him technical assistance from time to time. According to Rosamund Frost in a 1941 Art News article (10) Picasso had a large selection of Hayter's work and they used to exchange prints. 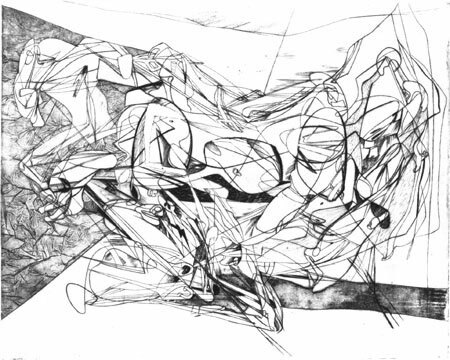 Stanley William Hayter (Combat) 1936 (c) 2016 Stanley William Hayter - Artists Rights Society (ARS) / ADAGP, Paris. Pablo Picasso (Guernica) 1937 - Collection of Museo Reina Sofia, Madrid. Hayter executed a number of paintings and prints inspired by the destruction and inhumanity of the war in Spain. "Combat", an engraving with soft ground, is a print of this period. This print has been compared with Picasso's painting "Guernica" which was painted the following year. Hayter was invited by the Ministry of Arts of the Republican government of Spain to visit that country. He slipped across the border with safe conduct papers. This visit to Spain made a lasting impression on him. On his return from Spain Hayter accepted an offer from Ambroise Vollard (the collector, dealer and publisher who had given Matisse, Cezanne and Picasso their first one man shows) to make a series of prints for publication based on Numancia by Cervantes. This was a tragedy based on the destruction of a Spanish city by the Romans in 133 B.C. When Vollard died in 1939 the portfolio was incomplete and the prints were edited individually. Atelier 17 was abandoned (with all its contents) in September, a day after war was declared in Europe. Hayter, a member of the British reserves, returned to England where he collaborated with Roland Penrose, Julian Trevelyan and others to organize a camouflage unit using the results of his research in Spain after witnessing the bombing of Madrid.